My dad’s favorite food (maybe in the whole world?) 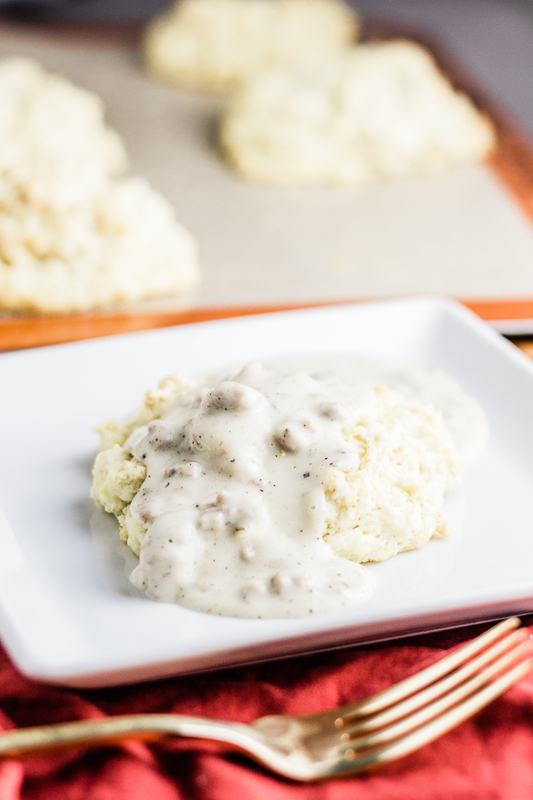 is Braum’s biscuits and gravy. As a matter of fact, I was making these for him and he said, “Well, it’s okay if they don’t turn out because then we can just go to Braum’s.” DAD. A LITTLE FAITH, PLEASE. As you know…I don’t bake much. So a huge thanks and shoutout to Julie at Bunsen Burner Bakery for letting me adapt her great drop biscuit recipe to suit my needs. She’s got loads of great stuff on her page, and WAY more desserts than me. I recommend popping over there for those types of goodies! I used her recipe for garlic cheddar biscuits, but left out the garlic and cheddar (ha) and doubled the size of each biscuit. It lengthened the cooking time, but they still turned out fluffy and perfectly ready for gravy. 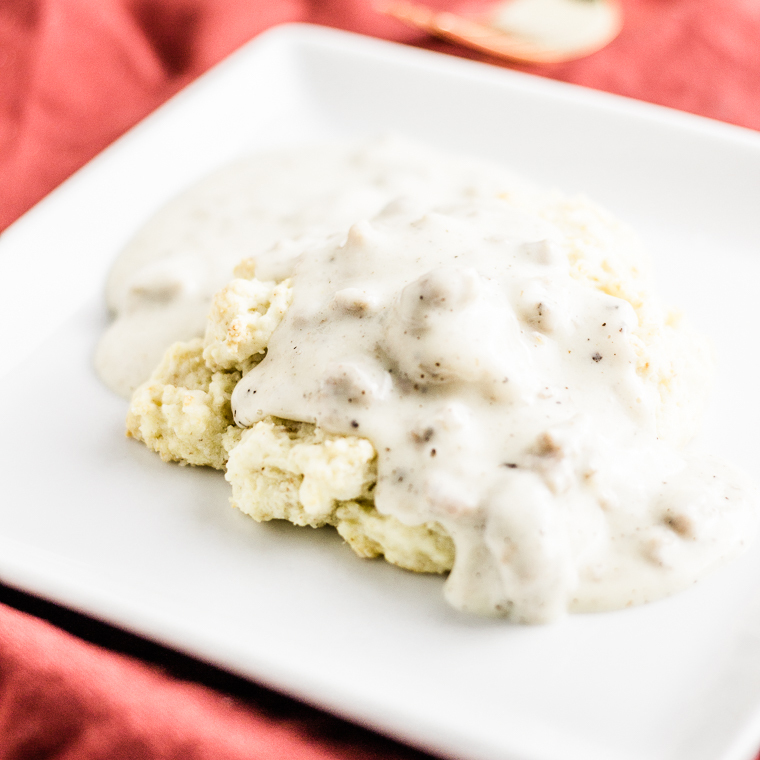 And as for the gravy situation…Breakfast sausage already has sage in it, and I thought browned butter and sage would be great flavors to incorporate into the gravy…I really can’t get enough of that combo. I’ll eat it pretty much any time. It’s my go-to fast dinner – pasta with browned butter and fried sage! So yum. Anyway. It was a natural fit, and it was a DELICIOUS choice. 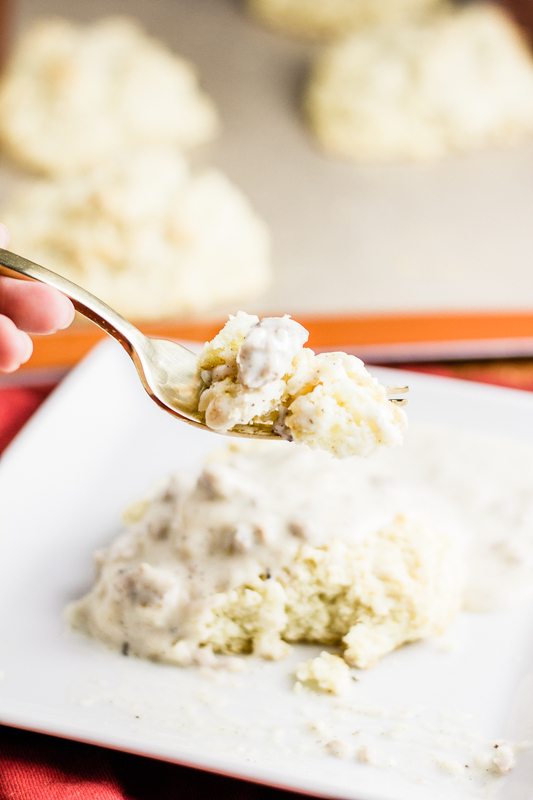 The result is a piping hot, tangy buttermilk biscuit served with rich sausage gravy with a touch of sweetness and nutty butter flavor. What could be better than that?! Also, this tip is per Julie, but the biscuits reheat great, if you pop them in the over or toaster oven at 325 for a few minutes! Mix together dry biscuit ingredients. Grate butter stick and add to dry ingredients. Using your fingers, combine mix and butter until most butter is pea-sized. Form a well of dry ingredients in the bowl and pour buttermilk into the center. Gradually stir in buttermilk until dough forms and is all incorporated. Spoon 6 large biscuits onto a silicone mat on a cookie sheet. Bake for 25-35 minutes, until golden brown on the top. Brown breakfast sausage in a skillet on medium-high heat. Drain and set aside. In the same skillet, melt a stick of butter on medium heat and when it begins to brown, fry sage leaves. Remove sage leaves and set aside. To the browned butter, whisk in flour to form a roux. Slowly incorporate milk until all well combined. Reduce heat to low, season with salt and pepper, and return sausage to mixture. Whisking occasionally, let gravy thicken to desired texture. 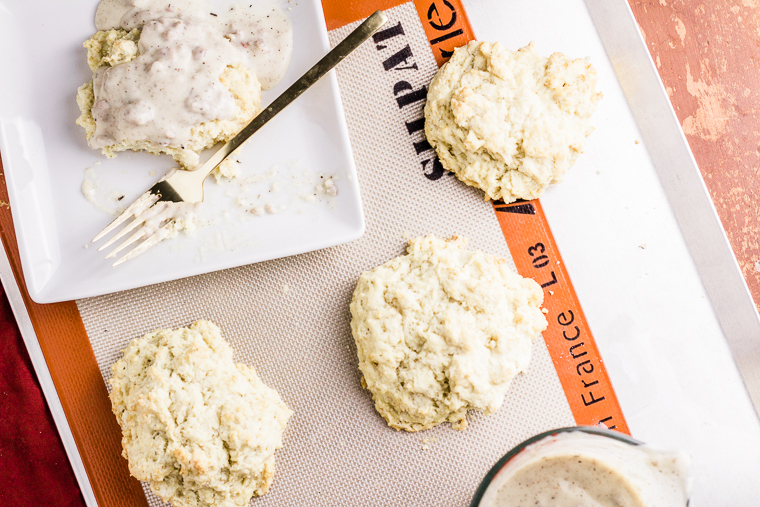 Serve immediately over hot biscuits. Crumble fried sage over the top or stir into the gravy. 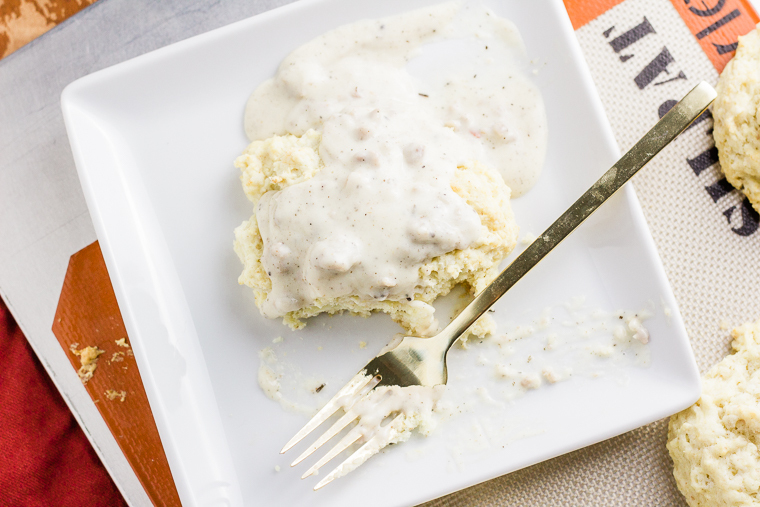 Biscuits and gravy are the bomb. They’re not just for breakfast anymore! These look SO GOOD! 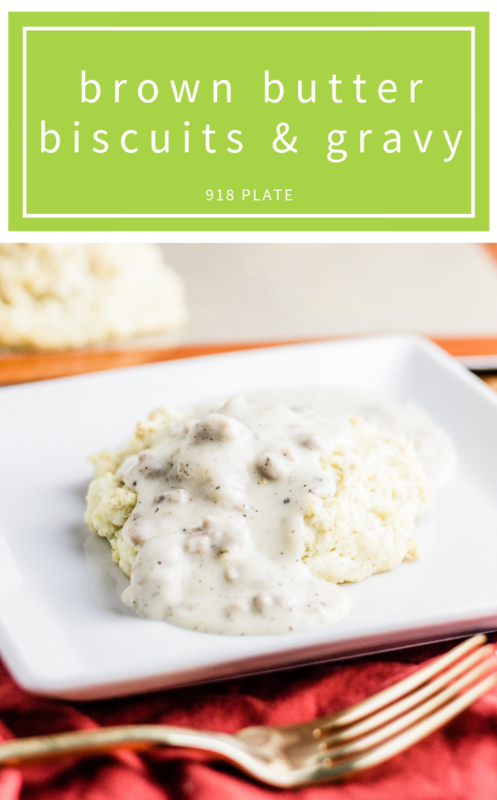 I’ve never thought of biscuits as a breakfast food, but now I can’t wait to try this! I hardly think of them as anything but breakfast!